Demonstrators chant slogans while flashing the Oromo protest gesture during Irreecha, the thanksgiving festival of the Oromo people, in Bishoftu town, Oromia region, Ethiopia (file photo). The protest movement playing out in Ethiopia is one of the most consequential conflicts on the African continent - more than any other, it has the potential to upend US policy in the Horn of Africa. It could disrupt counterterrorism efforts in Somalia and reduce the number of peacekeeping troops in South Sudan. But alarmingly, it has barely registered in Washington policy discussions or in the American press. In honor of Bekele Gerba's release, the Oromo strikes were suspended, and the crowds in the street turned jubilant. Then, on February 14, authorities stunned and delighted the protestors further by releasing other extremely prominent dissidents (including among others the blogger Eskindir Nega, opposition leader Andualem Aragie, former Gambella Governor Okello Akway, and the Muslim religious freedom activist Ahmedin Jebel), some of whom had been imprisoned on "terrorism" charges for years. Ethiopian prime minister Hailemariam Desalagn had promised the release of a large number of political prisoners in early January, and did later release a number of political activists, including opposition leader Merera Gudina. Government officials claimed at the time that the move was intended to widen the political space and foster a genuine dialogue with the political opposition and with the ethnic-based protest movements. But skeptics (including the majority of protestors) saw the move as largely symbolic, and perhaps even calculated to sow discord within the opposition, as some individuals were released and not others, and particularly as the most influential figures remained behind bars. After the events of February 13 and 14, however, there can be little doubt about the seriousness of the Ethiopian authorities. The severity and persistence of the protest movements have clearly become an existential threat to the regime, and the need to diffuse the protests' momentum is imperative enough, apparently, to overcome differences of opinion between the so-called "moderate" and "hardliner" factions with the Tigrean People's Liberation Front (TPLF), which is the most powerful faction with the ruling party. The TPLF's alarm is well-founded; the only question is whether its belated concessions to the protestors, after years of growing unrest, may be too little, too late. Anger at the perceived economic and political dominance of the small Tigrean ethnic faction is a moving force behind the protests, and the threat of a genocide or other targeted ethnic violence against Tigrean individuals appears to be escalating. Fearful Tigrean citizens have reportedly relocated in large numbers from the Amhara and Oromo regions of the country, and attacks on Tigreans (a rarity in the past) are reported. At the same time, violent clashes between other ethnic groups, particularly the Oromo and Somalis, have dramatically increased. Tensions are high across the board; the protestors are flush with victory; and the newly-released scores of political dissidents may vie for prominence. Is there any chance of the protests subsiding? Probably not, though it is surely the TPLF's hope that Bekele Gerba, Ahmedin Jebel, Eskindir Nega and their colleagues will prove to be wise and moderating voices in the coming dialogue. They have in the past not only been decisively less radical, but have been firmly committed to non-violence - unlike the radio and social media personalities, some of the based in the diaspora, that have risen to prominence in their absence and are now driving the opposition discourse in real time. Having achieved so much through protest, it is unlikely that the Ethiopian people will accept half-hearted reforms. Speculation is rampant, for example, that Prime Minister Hailemariam Desalagn - who is not Tigrean but is widely regarded as an instrument of the TPLF elite - will be replaced with an Oromo at the ruling party's upcoming conference in three weeks' time. (Lema Megersa, president of the Oromia Regional State, is a prime focus of this speculation.) These rumors are mere speculation, but have taken on the force of expectation, and disappointment could easily lead to another round of protests. Another round of civilian deaths at the hands of Ethiopian security forces, or the declaration of another state of emergency, could have the same effect. 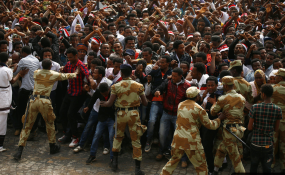 Next time, the Ethiopian government's concessions may not be enough to halt the protests. If dialogue fails, and the security forces are unleashed, the resulting conflict will be bloody and awful - and will certainly not succeed in ending the uprising. Washington, of course, has every incentive to avoid such a scenario. The United States has much at stake in Ethiopia, whose troops and cooperation have been essential to Washington's efforts to stabilize Somalia and South Sudan. American strategy in the Horn of Africa is deeply flawed and is demonstrably failing to achieve its objectives (as the situation in both countries continues to deteriorate). But no alternative policy proposals are on table, and a sudden collapse of Ethiopian capacity to support American policies with African boots on the ground would be catastrophic. The African Union mission in Somalia, already on its last legs, would probably not survive a sudden and wholesale withdrawal of Ethiopian forces - and countless civilian lives in Southern Sudan would be endangered. A disordered Ethiopia is of course more vulnerable to incursions by the al Qaeda-linked Somali terror group, al Shabaab, which has already managed to establish a vibrant offshoot in Kenya amid similar social conditions (a large population of unemployed youths, a disenfranchised and villified Muslim population, and rampant police brutality). Unfortunately, few countries are more poorly positioned than the United States to play a constructive role in Ethiopia's future. This stems from Washington's long history of providing budgetary support to the Ethiopia's ruling party, the close cooperation between the two countries' military and intelligence services, and the long-standing refusal of American officials to criticize the human rights record of the regime or to challenge the imprisonment of thousands of civilians. The most credible voices among the protest movement have already condemned US inaction, and would not consent to a dialogue with US officials - indeed, they argue that engaging with Washington would erode their credibility, and they are probably right. Washington can of course attempt to pressure or persuade the TPLF to undertake credible and meaningful reforms - but Washington's chequered diplomatic history with Addis suggests that such efforts are unlikely to bear fruit. It is also unclear what reforms would appease the public: while there have been calls for Ethiopian security forces to leave the Oromo and Amhara and other regions (including the Somali or "Ogaden" zone), absolutely no one is demanding fresh elections (which have historically been heavily rigged) or other staple democratic measures to restore the peace. The next month, and days, will be decisive. The Ethiopian regime will either commit to its current course and expand on its commitment to reform, signaling this commitment perhaps by offering the prime ministership to an Oromo leader. Or it will double down on its previous course, and declare a state of emergency. But this would be a deadly decision, as a new state of emergency would surely be regarded by opposition leaders and the protestors as a declaration of war. Ethiopia's only hope for peace is a series of rapid and sincere concessions by the TPLF elite, which must certainly involve a meaningful redistribution of political and economic power. The Ethiopian public has tasted its power, and one way or another, the status quo will not survive.